We’ve built our reputation by consistently providing excellence. So, whether you need contract, short term rental or operated hire, you can expect to receive the best service delivery, the highest levels of utilisation and the highest specification vehicles. We put a real emphasis on working in partnership, so we can offer you a solution that suits your requirements precisely and at a competitive price. Notting Hill Carnival is a renowned annual event which has taken place since 1964 across every August bank holiday weekend in London, with Afro-Caribbean communities coming together to celebrate their own cultures, history and traditions. As one of the world’s most popular and diverse cultural celebrations – with only Rio de Janeiro hosting a bigger carnival – the event has grown from over 500 visitors in 1964 to over 2,000,000 in 2016. While Sunday is a family-friendly day, Monday has developed a reputation for being the more boisterous of the two. The sheer volume of visitors, combined with the small area span, can see waste and litter on the streets increase dramatically which, if left, can cause hazards and pose great risk to the safety of the public, businesses and local residents, as well as an impact on ecological systems and the surrounding environment. Every year, it’s hugely important to maintain a clean and safe environment before and after the event. It is also important to ensure that any street cleaning completed causes as little disruption to the event as possible. 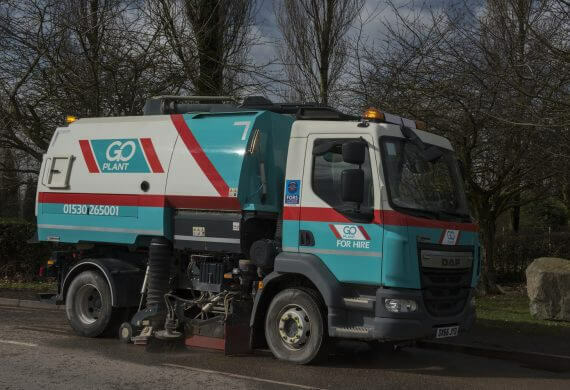 We were called upon by the leading waste management company and long-standing client, Veolia, for the sixth consecutive year to provide five large operated sweepers with mounted brooms on-site to undertake two overnight clean-ups. 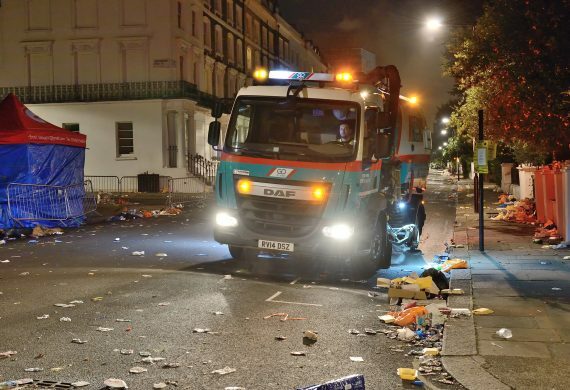 In 2016, we helped to collect 180 tonnes of waste after the carnival. This was taken to be fully sorted, segmented, and wherever possible, recycled. To find out more about the project or to discuss your street cleaning needs, please do not hesitate to contact our expert team today. 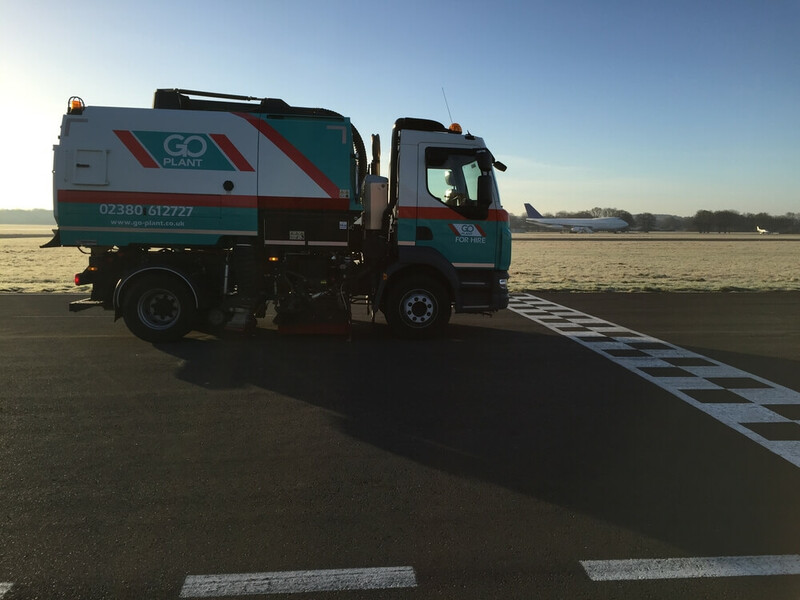 You can also find out more about our large operated sweepers by following the link below. 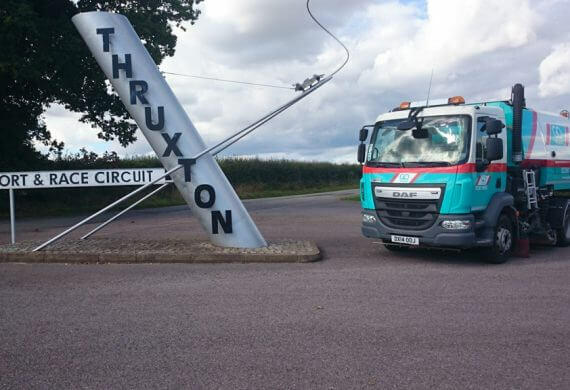 Here at Go Plant Fleet Services, we are proud to have been associated with Thruxton Racing Circuit for over ten years. In that time, we have ensured thousands of Thruxton’s happy customers are protected against spills and debris on the track which, if left, could cause accidents. 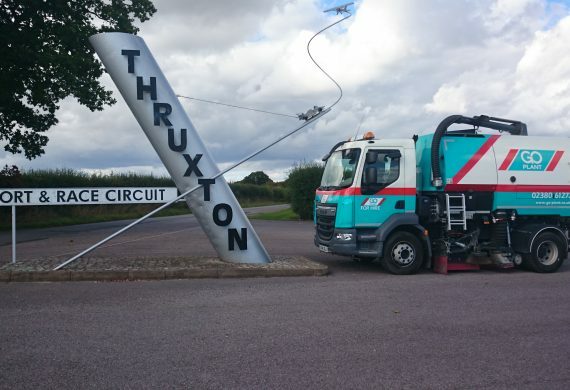 Thruxton would be liable if an accident could be proved to have been caused by an unclean track, so it is vitally important they can trust the company providing them with sweepers. The 2.4-mile track in Hampshire – the fastest in the UK – hosts two of Britain’s largest race championships, British Superbikes and British Touring Cars, as well as other races throughout the year. Originally constructed as a Second World War airfield, the circuit has been used for motorcycle racing since 1950 and motor racing since 1952. 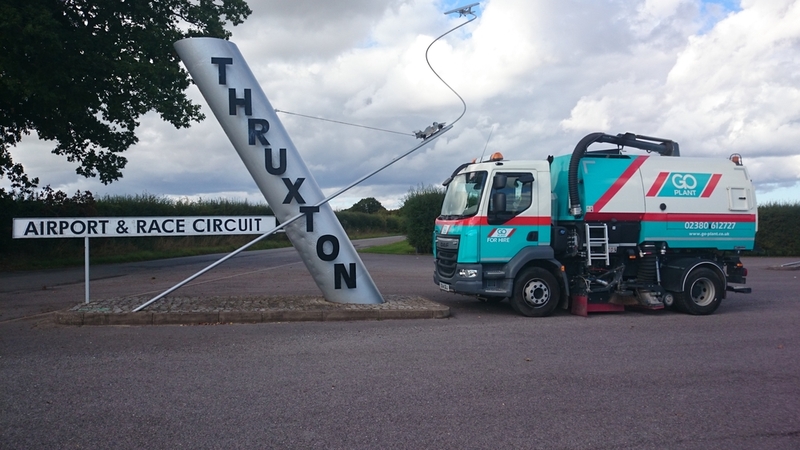 We provide a regular mid-week sweep at Thruxton to keep the tarmac completely clean and free of any rubber deposits, oil spills or debris. We also help clean up the track for its experience days, which attracts around 8,000 racers each year. Some of the most exotic cars such as Lamborghini’s, Ferrari’s, Aston Martin’s, Audi A8s and Porsche’s are driven on those days and the cost to replace any damaged parts can easily mount into tens of thousands – with a single windshield costing hundreds, if not a couple of thousands, to replace. 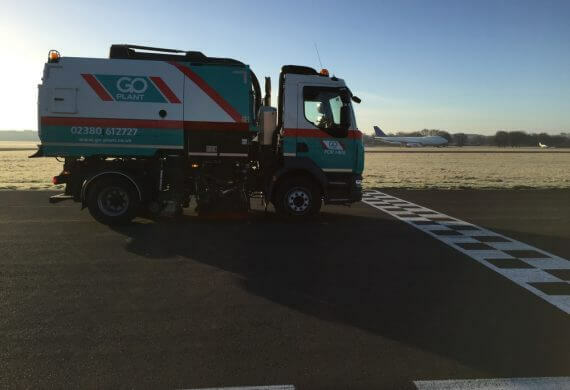 We’re always available to the track on demand too, meaning we will send our sweepers out as and when needed, before or after each race or event. At big meetings like British Touring Cars, we ensure we have two sweepers in attendance to get the job done quickly and effectively. It is long-term contracts with big names such as Thruxton which have enabled us to establish ourselves as the UK’s leading provider of operated and self-drive hire vehicles, consistently providing the best service possible with the high-specification vehicles. Our emphasis on working hand-in-hand with all our partners and customers means we can offer a tailored solution to suit any requirements, just like we do with Thruxton, at a competitive price. 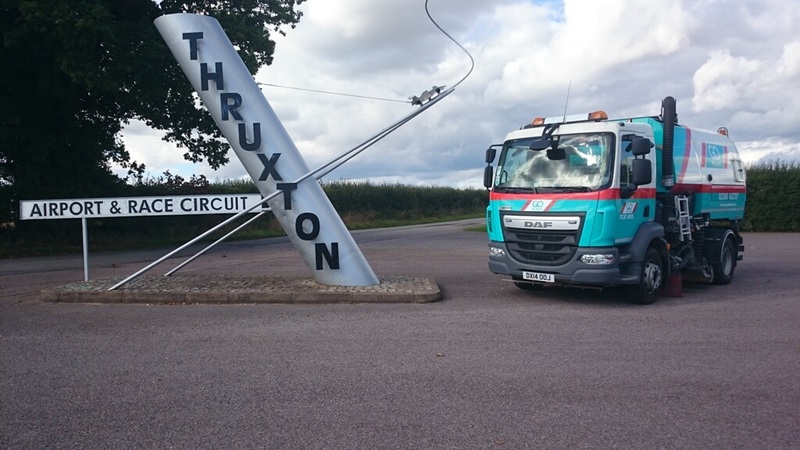 We are looking forward to continuing our partnership with Thruxton Racing Circuit for many years to come. Rotherham Metropolitan Borough Council recently called upon the team at Go Plant Fleet Services to provide a VT651 road sweeper and an experienced operated driver as part of the Council’s Regeneration and Environment Service roadworks in Rotherham. The central reservations and the offside channels along a section of A road in the South Yorkshire town required in-depth road cleansing during an eight-hour shift on a Sunday morning. 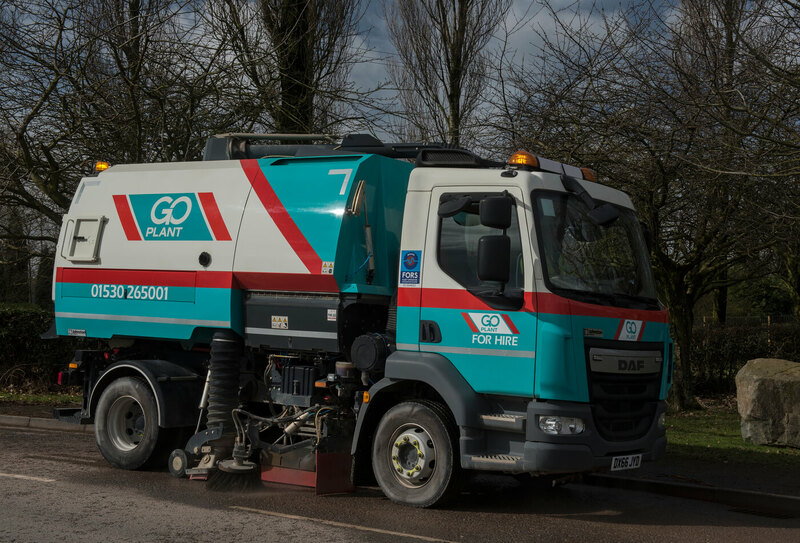 Andy Roddis, Specialist Cleansing Service Manager at the Council, explained: “On arriving at the site, the Go Plant Fleet Services driver personally introduced himself to the cleaning team and discussed exactly what was required of him during his shift.